A 24-year-old driver who caused an horrific two-car crash which left three people seriously injured has been jailed for three years. Dewsbury man Ihtisham Shabir was “showing off” in an Audi vehicle as he drove family and friends to a restaurant at the end of Ramadan in June 2015 when he lost control on a bend and smashed into a VW Golf coming in the opposite direction on the A644 Wakefield Road at Cooper Bridge, Brighouse. A court heard today (Wednesday) how one witness had suggested that Shabir was doing 100mph on the 50mph road and prosecutor Chloe Hudson said frightened occupants in the Audi had told him to slow down as they heard its tyres screeching. She said Shabir told them he knew what he was doing and overtook several cars at high speed before crashing into the Golf. Judge Jonathan Rose described the damage to both vehicles as “horrendous” after seeing photographs of the aftermath and Miss Hudson outlined details of the injuries caused to the four passengers in the Audi and the three occupants of the Golf. 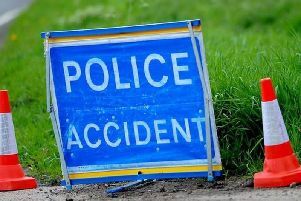 The most seriously injured was Bradford man Fiaz Ahmed, the driver of the Golf, who was on his way to work that night. The 40-year-old suffered a catalogue of injuries including bruising to his brain, multiple fractures to his pelvis and spine and lacerations to his liver and spleen. He was in hospital for three weeks and had to undergo surgery to insert metal plates and screws. In his victim impact statement he described how he had been left with a permanent disability and had constant pain in his lower back and right leg. He said he had been unable to return to work and now felt “trapped” in his home. Mr Ahmed’s brother Iftikar suffered a chest injury and extensive damage to his right hand and wrist. In his statement he said he had severe nerve damage to his wrist and was not sure if he would be able to go back to work. A talented teenage boxer, who was a rear seat passenger in Shabir’s car, suffered an open skull fracture in the crash and Bradford Crown Court heard that he had been left devastated by the news that he would not be able to fight again. Four other occupants in the two cars also suffered a variety of injuries in the crash. Shabir, of Bower Lane, Dewsbury, answered “no comment” when he was interviewed by police about the crash, but last year he pleaded guilty at a magistartes court hearing to three charges of causing serious injury by dangerous driving and dangerous driving. His case was committed the crown court for sentence and Miss Hudson pointed out that the maximum sentence for the offence of causing serious injury by dangerous driving was five years in jail. Shabir’s lawyer Anastasis Tassou submitted that his client, who had no previous convictions and an unblemished driving record in the past, had only ignored the warnings “for a few seconds” before the crash and the dangerous driving was over a relatively short period of time. Mr Tassou said Shabir’s remorse was genuine and the court heard that his client had himself been assaulted in retaliation following the crash. Judge Rose noted that Shabir’s only explanation for the incident was that the Ramadan fast had come to an end that day and he was rushing to a restaurant to eat. He said Shabir had made a conscious decision to drive at very high speeds and his case was aggravated by the fact that his passengers were repeatedly telling him to slow down. Judge Rose said the only possible conclusion was that Shabir was “showing off” with a wanton disregard for the safety of his passengers and other road users. The judge explained that it was “contrary to all principles of sentencing” for him to impose consecutive five-year jail terms for each of the three offences of causing serious injury by dangerous driving. He said it had been a single incident and the jail terms had to be concurrent. Shabir was given a third off the starting point of 54 months in prison because he pleaded guilty at an early stage of the proceedings and he was banned from driving for the next four years. He must also take an extended driving test at the end of the ban.